HONOLULU – Torrential rains caused by a powerful hurricane hit the Big Island of Hawaii on thursday. Declared state of emergency even if hurricane has downgraded to cathegory 3. It still remain a dangerous situation, and Hawaii Red Cross is comunicating what to do to people in order to carry out a safe evacuation. Red cross is in action now to assist people and 100 residents were told to evacuate their homes due to increased danger of flooding. Authorities went from house to house in the Big Island neighborhood, telling residents that those refusing to evacuate may nt be able to be rescued by first responders should conditions worsen. Hurricane Lane made the part of the island of Hilo underwater and torrents of water flowing into streets. Four people had to be rescued from their homes, and one house was significantly damaged. The island remains under a flash flooding warning. National Weather Service said rain rates of 2 to 3 inches an hour were being recorded in South Hilo and Puna districts. They also warned more rain bands are approaching the island from the southeast. 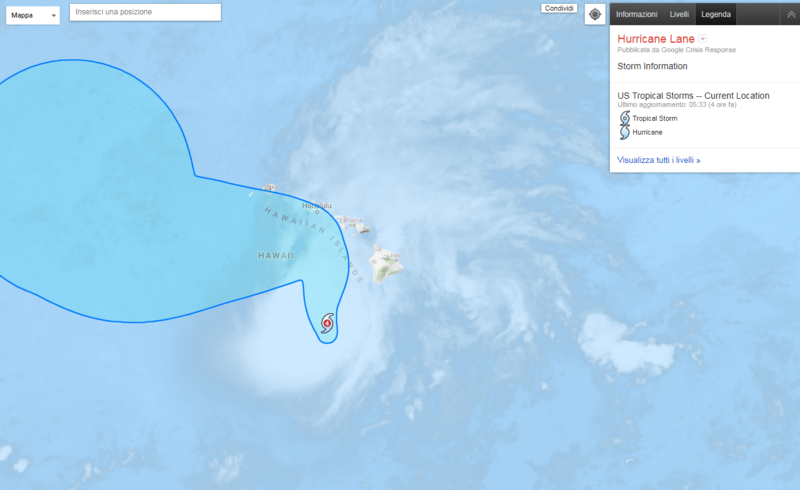 Hurricane Lane is headed toward the Hawaiian Islands today as a major storm with strong winds, heavy rain and flooding. The American Red Cross is preparing a large response effort and urges people in the path of the storm to get ready now. Hurricane Lane could impact the islands through Saturday. The storm could bring up to 20 inches of rain, causing dangerous flash flooding, mudslides, coastal flooding and damaging waves. Hawaii officials have canceled public schools, terminated bus service and closed ports among many other preparations for Lane. The Red Cross is making extensive preparations to respond to Hurricane Lane by mobilizing volunteers, equipment and supplies in Hawaii. 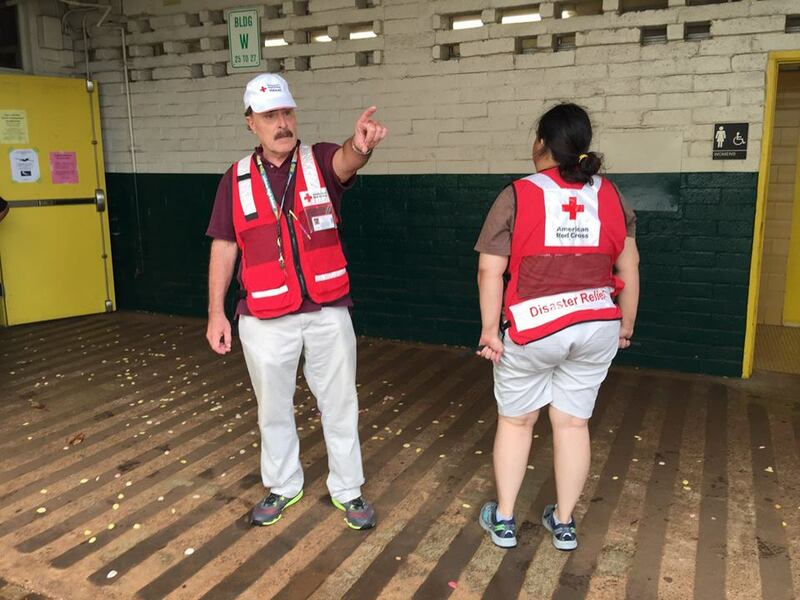 In addition to local volunteers, the Red Cross has deployed nearly 200 trained disaster workers to Hawaii, including an experienced leadership team and IT professionals to support emergency communications equipment. If needed, additional volunteers are ready to deploy after the storm hits. Evacuation shelters may not have cots, food, running water or electricity. They are meant to safely house people for about 72 hours until the storm passes and weather conditions improve. If needed, local government officials may transition evacuation centers into emergency shelters if residents can’t return home after the storm passes. The Red Cross supports pre-landfall evacuation centers and post-landfall emergency shelters with trained workers, shelter supplies and other aid. Our partners, specifically The Salvation Army, handle nearly all emergency feeding with their kitchens and volunteers on the Islands. If you need to find an evacuation center, download the free Red Cross Emergency App to have real time information at your fingertips. The Emergency App is available in app stores by searching for the American Red Cross or going to redcross.org/apps. Or text ‘GETEMERGENCY” to 90999. Many Hawaiians shelter-in-place, as do tourists in hotels who choose to remain through the hurricane. People in the path of this storm should stay informed and take steps to get prepared now. Listen to local radio, NOAA radio or TV stations for the latest information and updates and obey any evacuation orders from local officials. If you do not live in a flood-prone area, you should prepare to shelter in place. If you live in a flood-prone area, you should find an available shelter. Be familiar with evacuation routes, have a family communications plan, keep a battery-powered radio handy and have a plan for pets. Know your evacuation zone and be sure to follow the direction of local officials if an evacuation is ordered for your area. You can learn more about what to do before, during and after a hurricane here. The Red Cross works 24/7 to be ready to respond to disasters such as hurricanes. Even before the first raindrop falls in Hawaii, the Red Cross is spending money to get ready. Please donate to the Red Cross now to help. Help people affected by Hurricane Lane by visiting redcross.org, calling 1- 800-RED CROSS or texting the word LANE to 90999 to make a $10 donation. Donations enable the Red Cross to prepare for, respond to and help people recover from this disaster. ADGP $1 Million members are: Adelson Family Foundation; American Airlines; Anheuser-Busch Foundation; Anthem Foundation; Bank of America; Brown & Brown, Inc.; Caterpillar Foundation; The Clorox Company; ConocoPhillips; Costco Wholesale; Delta Air Lines; Enterprise Rent-A-Car Foundation; FedEx; Grainger; The Home Depot Foundation; LDS Charities; Lowe’s Companies, Inc.; Mazda North American Operations; Microsoft Corp.; Nationwide Foundation; New Balance Foundation and New Balance Athletics; PepsiCo Foundation; State Farm; VSP Global; Walmart and the Walmart Foundation; and The Walt Disney Company.